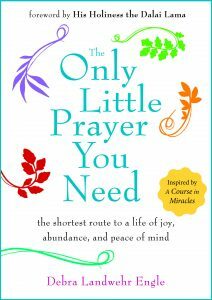 The Only Little Prayer You Need: The Shortest Route to a Life of Joy, Abundance and Peace of Mind—that’s a big title for a very simple little book. But it’s a fitting title for many reasons. We live in a world that breeds fear of countless things in our external lives: school shootings, unemployment, home foreclosures, health crises, rising prices and natural disasters, to name just a few. Whether they’re external or internal, our fears wear us out, keeping us stuck and afraid to move forward in our lives. In contrast, asking, “Please heal my fear-based thoughts about our mortgage” also gives you a sense of relief. But instead of lifting just that burden, it relieves the need to re-create that fear and hold onto it. This prayer heals your very desire for burdens, your addiction to fear-based thoughts, freeing you to live without that fear and with greater peace of mind. As a result, your financial situation is free to improve. That’s what makes it so different. This prayer is based on the teachings of A Course in Miracles, which has millions of devoted followers around the world. Incredibly simple, it focuses on a prayer that emerged in my life after years of studying and teaching the Course. I invite you to try using the prayer in your daily life, asking for your fear-based thoughts to be healed about specific issues or mind chatter as you go through the day. If you have results you’d like to share, please contact us. And if your book club, study group, church or other organization would like to schedule a discussion, presentation, workshop or retreat based on The Only Little Prayer You Need, contact us.